Start your New Year in this home! Start your New Year in this home! 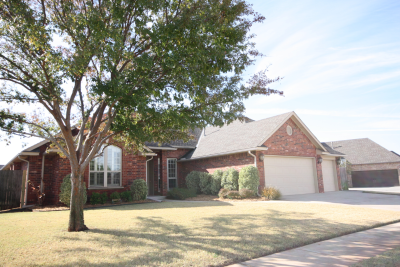 You'll love this beautiful, move-in ready home in the wonderful Vintage Farms addition! 4 bedrooms with the 4th bedroom that adjoins the Master bedroom. The 4th bedroom can easily be a nursery or a study. This open concept home with 11' foot ceilings in most rooms is done in neutral tones with a newly painted interior and new carpet. The living room boasts a large fireplace and the front rooms are covered with Plantation shutters. The Master Bedroom is 17 x 13 and the en-suite bath has a jetted tub, separate shower and an Australian closet An oversized, 3 car garage has a storm shelter (6-8 people) in the garage floor. Spacious backyard with plenty of room for a garden and a covered patio is wired for sound and natural gas plumbed. Walking distance to the award-winning Eastlake elementary. Come look at this one today! It won’t last.